Mae West practically single-handedly saved Paramount from bankruptcy, while Bette Davis was the first actress to bring a little glamour to the hardboiled Warner Brothers studio. Yet, despite their mutual admiration, it took decades for the two movie stars to finally meet. Optometrist and volunteer bartender Wes Wheadon was a fly on the wall when they did and he has the standard audio cassette recording to prove it. With the help of lip-synching actors, he recreates the lively early 1970s dinner party in the hybrid documentary When Bette Met Mae (trailer here), which screens during the 2015 NewFest. Davis had four husbands and West never had a shortage of men, but both became gay icons, in part through drag show impersonations. It was a phenomenon they discussed on that night in 1973, so WBMM is not so out of place at NewFest. Sadly, the movie business had largely forgotten them at this point, but Davis still worked regularly in television, resenting nearly every minute of it. Having invested wisely in real estate, West did not need to work at all. Still, neither was the type to sit about idle. Despite its obvious artificiality and the disorienting distance between the on-screen figures and their voices, it is rather lovely to hear the real life Davis and West again, in any context. The former was especially her tart-tongued self, venting her spleen against agents, producers, and former SAG president Ronald Reagan. In retrospect, most historians give Reagan credit for standing up to the moguls, but clearly anything less than a May Day storming of the studio barricades would not impress Ms. Davis. Wheadon, who had already been pulled into Bette Davis’s orbit through mutual friends at the dinner party, serves as an easy-going and informative host. He augments the gossipy conversation with some intriguing background and context on the often overlooked later years of the two stars’ lives. It is particularly amusing to hear New York publicist Gary Springer (whom those of us who cover film and theater know and respect quite well) speak of an evening at Town Hall his father produced. Conceived as a sort of 92Y-style Q&A, it became a command appearance for the royal Davis to receive her adoring fans (who were apparently 99% gay men). Nevertheless, since the breezy forty five minute dish session constitutes the core of the film, Wheadon can barely stretch it past sixty minutes. Karen Teliha and Victoria Mills are both the respective spitting images of Davis and West, but Teliha also shows a command of the former’s instantly recognizable mannerisms. She seems comfortable in Davis’s skin, whereas Mills does not. However, the night was largely Ms. Davis’s show, so we can just watch and listen to her do her thing. The graphics and Jack Anderson’s cinematography have a retro vibe that look like they might have been produced in 1973, along with the muffled audio. Yet, there is something appealing about its throwback grunginess. It is also a NewFest selection that could draw a lot of straight fans, because Mae West was Mae West and Bette Davis was smoking hot in The Letter and The Man Who Came to Dinner. 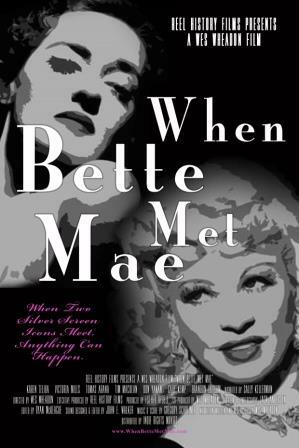 Recommended for fans of Golden Age Hollywood, When Bette Met Mae screens Thursday afternoon (10/22) with the short film, Who Stole the Ruby Slippers, during this year’s NewFest.